One of the most interesting years in mobile phone design, 2004 saw some iconic handsets and also some heroic failures which might just have changed the mobile world for the better if they had taken off. 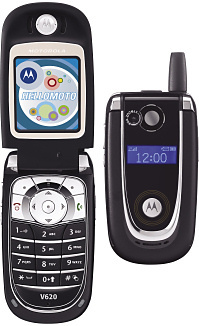 Motorola had a promising year in 2004, breaking new ground in both 3G and fashion phone markets. The most iconic phone of 2004 (and possibly one of the most iconic phones of all time) was the Motorola RAZR V3, a striking aluminium clad design which was notable for its very slim form factor, although the user interface was notably horrible to use. 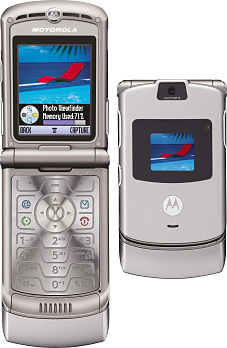 The RAZR turned around Motorola's flagging fortunes, but a fixation with this type of design almost killed the company. 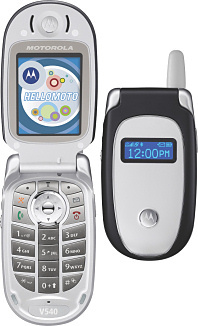 Motorola was also one of the leaders in the 3G market, the Motorola A1000 was a touchscreen smartphone with GPS that came out three years before Apple entered the arena. But 3G sales didn't really take off until much later, and Motorola seemed to lose interest in this market sector. It wasn't helped by the fact that the biggest 3G network in Europe (Hutchison 3) only allowed access to a limited number of "walled garden" sites rather than the whole web. Back in 2003, Windows Mobile was still thought to be the next big thing and the Motorola MPX220 combined Windows with the then-popular clamshell form factor to come up with a device that looks very strange these days. Despite the clever packaging, it failed to sell in any significant numbers and was plagued with hardware problems. 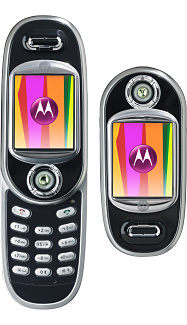 A rather unusual form factor is present in the Motorola V80 with a rotating display that did win quite a few fans. It certainly stood out against Motorola's usual offerings. 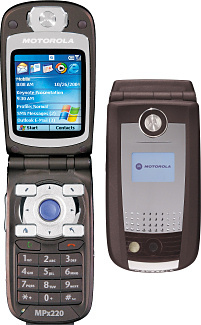 Despite these innovations, most of Motorola's sales during 2004 came from their V500 and V600 series of clamshell phones which showed some attractive designs, but they still lacked the ease-of-use of their main rival, Nokia. From a 2011 perspective, Motorola have struggled to remain a player and now currently almost exclusively active in high-end Android devices. Coming out of a miserable 2003, Nokia spent 2004 trying to win back market share with a scattergun approach to models and designs. Nokia broke with tradition in many respects, something that we are seeing echoed with its struggles in 2011. At the top end of the market, the Nokia 9500 Communicator offered a big screen and QWERTY keyboard, a new version of Symbian and WiFi but for some reason lacked 3G support. The brick-like design and weight put all but the most dedicated of customers off.. and surprisingly it took Nokia three years to replace it. A much smaller version (initially without WiFi), the Nokia 9300 was launched the same year, and it proved to be a popular device despite a lack of high-speed data support. Launched roughly at the same time as the 9500, the Nokia 7710 touchscreen phone was ahead of its time to the point that the technology couldn't really deliver what users actually wanted. A lack of 3G and a frankly pretty awful display killed off Nokia's touchscreen efforts, and it took four years for them to revisit the market with the Nokia 5800. Handheld gaming consoles are pretty popular these days, but back in 2004 Nokia were also trying to get into the market. A follow-up to the original N-Gage console, the Nokia N-Gage QD was more compact and focussed on games. It's another one of those frustrating cases where the state of contemporary technology wasn't really up to it, and Nokia gave up this approach shortly afterwards. Despite a lack of 3G in some other high-end devices, Nokia were certainly pushing ahead here with the chubby Nokia 6630. Again, 3G customers were few and far between, but the 6630 was a popular choice for those customers who were using those fledgling 3G networks. Sometimes companies like to experiment, and in the case of the Nokia 7610, Nokia certainly went to town. Trying to break free of the sort of boring monoblock design that Nokia were known for (you know, the sort of phones that people actually bought), Nokia came up with the radical sweeping design of the 7610. The really weird keyboard looked interesting, but the layout was off-putting and was a distraction from the fact that this was a very capable device for its day. 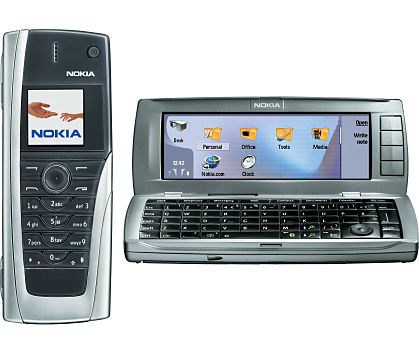 Nokia later replaced the keyboard with the supposedly more sober Nokia 6670, which somehow managed to look even uglier. 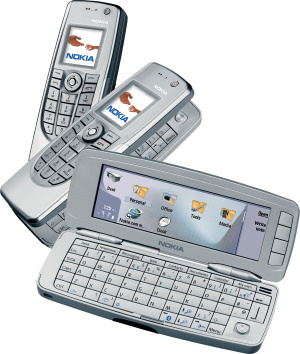 Also in the weird design club was the Nokia 2650, a short lived cross between a phone and a sun-lounger. A simple and quite usable device, the strange design was certainly eye-catching if nothing else. 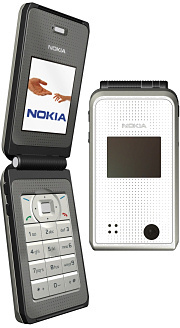 Novel materials also found themselves into the design of the metal-clad Nokia 6170. Sadly a pretty basic device underneath, the 6170 is probably one of the best looking Nokia handsets that we can remember. Another smart design, this time with a smartphone underneath was the Nokia 6260. A Symbian device with a swivelling screen in a clamshell form factor, the 6260 was certainly interesting to look at. Clamshells were very popular during 2004, although they are quite rare today. 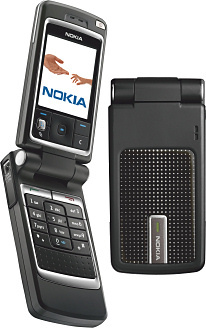 One of the most radical Nokia designs ever was the Nokia 7280 "pen phone". Lacking a keyboard, the 7280 was mostly controlled through a "rotator" and had a small display hidden behind mirrored glass. The pen phone format died out, and these devices are now quite collectable.. although perhaps still not very usable. A sibling to the 7280, the Nokia 7260 was a device that we hated at the time, but in these days of black slabby touchscreen phones, the 7260 is at least interesting to look at. It was an enormously popular phone, although even at the time it was depressingly basic underneath the radical exterior. Another popular phone, the Nokia 3220 was aimed at the mass-market, but in a funkier package than its predecessors. A good combination of interesting design, light weight and low cost led to this being a very strong seller. 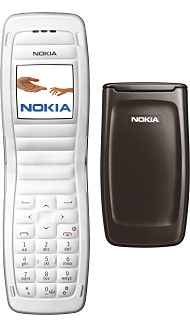 Not every Nokia was a radical design. The Nokia 6610i managed to combine dull looks with a pretty unrewarding user experience and a rubbish stills camera tacked onto the back. However, this unappealing and unloved device still managed to sell quite well.. usually to corporate and business customers. Founded in 2001, Sony Ericsson were beginning to get into their stride by 2004 with some technically advanced and stylish designs. However, as with Motorola, Sony Ericsson have struggled in recent years (partly due to losing focus with dozens of "Walkman" phones) and now focus mainly on high-end Android devices. Following on from the P800 and P900, the Sony Ericsson P910 was a UIQ-based Symbian smartphone with a relatively large touchscreen and a tiny QWERTY keypad. It wasn't much of an upgrade over its predecessors, and the lack of 3G or WiFi in an otherwise advanced device spoiled it. Even so, there was very little to challenge Sony Ericsson at the time, although most phones these days are now touchscreen devices. Going to show that Nokia was not the only firm that could come up attractive mobile phones, the Sony Ericsson T630 followed on from the iconic T610. 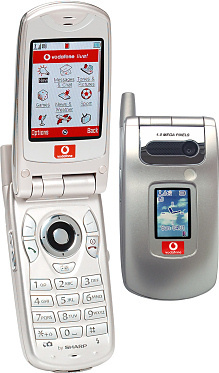 Again, a basic phone in a pretty package, the T630 was a popular device with a memorable semi-translucent case design. A step up from the T630, the Sony Ericsson K700 marked the beginnings of Sony Ericsson's well regarded K-Series of Camera phones (in Swedish, "Kamera"). A bit smarter and better specified than most rival Nokias, the K700 was one of Sony Ericsson's best-selling phones up to that point. Even though HTC didn't sell phones under its own name until 2006, it was already a significant player in the Windows Mobile market, with handsets often turning up with carrier branding or under the i-Mate name. The HTC Blue Angel sold under various names, including the T-Mobile MDA III and the O2 XDA IIs. O2's original XDA was probably the first widely available touchscreen Windows smartphone, launched the previous year and then followed by the XDA II. This device had a 3.5" QVGA touchscreen and WiFi, but the main addition was the slide-out QWERTY keyboard. A more traditional design, the HTC Typhoon sold under different names including the Orange SPV C500 and T-Mobile SDA. Despite running Windows, the Typhoon was quite a basic device.. but at 100 grams in weight, the Typhoon was much lighter than other Windows smartphones. Another device on the market was the HTC Magician, sold as the T-Mobile MDA Compact and under other names. The Magician was a reasonably successful attempt to get a more pocket sized touchscreen phone, even though it had to compromise on features. Remember Sharp? 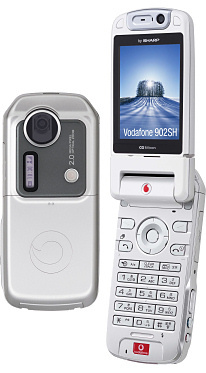 2004 was probably their best year in Europe with a number of class-leading devices. Despite being ahead of the pack, Sharp never made the breakthrough it needed in Europe and eventually it faded from view. The first phone to break the one megapixel camera barrier, the Sharp GX30 also had a 2.2" QVGA display, better than almost all the competition, plus Bluetooth and a SD card slot. The catch was that you had to be a Vodafone customer to get one. Sharp went several better with the Sharp 902, again exclusive to Vodafone. 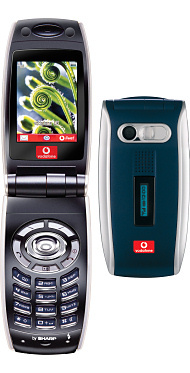 This was one of the launch devices for Vodafone's 3G network, and this came with the first 2 megapixel camera and a 2.4" QVGA swivelling display. As with other Sharp devices, the display technology took advantage of Sharp's expertise in LCDs. Although the 902 should have been a world-beater, it was very expensive and interest in 3G networks didn't really materialise until some time after the 902 was obsolete. Unlike the 902, the Sharp GX25 was very successful. Again, Sharp squeezed in a QVGA display and Bluetooth in a very compact package weighing just 90 grams. The GX25 still manages to look quite contemporary even all these years later. Once a major player in the European market, Siemens has almost been forgotten now but did manage to come up with some innovative devices. 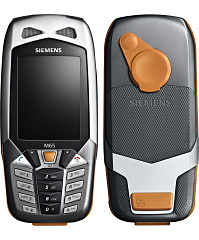 There's now a small but significant market segment for tough phones, and the Siemens M65 was one of the earliest examples. With a rubber case that was water, shock and dust resistant, the M65 was the sort of thing that could survive a bit of rough treatment. Something that never caught on was the design of the Siemens SK65. It tried to answer the perennial problem of how to fit a QWERTY keyboard in an unusual way - the keyboard rotated out from behind to form a cross shape. 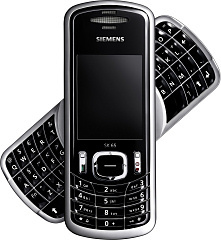 Too radical for consumers, the Siemens brand was never very popular with corporate customers either, leading to the SK65 being a very rare device these days. Most large mobile phone companies manage to make the occasional iconic or stand-out device in design terms. 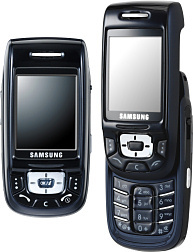 Samsung is one of those companies that seems to struggle with this, but perhaps one of the most fondly remembered is the Samsung D500 slider. A cute slider with a decent camera, and one of the first Samsungs to support Bluetooth, the D500 was a huge sales success. Probably the company with the most turbulent history in this industry that we know of is Palm, back in 2004 it was known as PalmOne. PalmOne had badly miscalculated the smartphone market, and was stuck making standalone PDAs which it was becoming apparent was a dead-end market. To get round this, it bought a small manufacturer of PalmOS based smartphones called Handspring, and with it their Treo line of phones. The PalmOne Treo 650 was the first in-house design, and although it was never a huge sales success it was enough to keep PalmOne in business and kept Palm fans happy. Most Japanese phone manufacturers (apart from Sony) no longer have a significant presence in Europe.. but Sanyo probably has one of the shortest histories. An attempt to break into the new 3G market with the Sanyo S750 met with a remarkable lack of success. Although the hardware specification was competitive with rivals, the build quality was questionable and the phone looked a complete mess. Sanyo fixed many of these shortcomings with an upgraded version in 2005, but by then it was too late and they pulled out of the market. 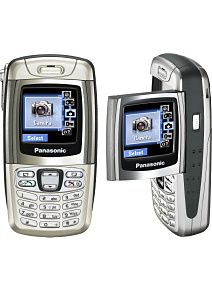 Another Japanese manufacturer that pulled out of Europe, Panasonic were getting increasingly uncompetitive by 2004. The Panasonic X300 is one good example - the X300 had a basic flip-out display, just like a modern digital camcorder, and it was indeed capable of recording video on its basic camera, but there was hardly any internal storage and getting videos off the phone was very difficult. Although there were many other equally poor devices on the market, the flip-out screen raised expectations that the X300 simply could not match. French manufacturer Sagem showed promise in 2004, the Sagem myC-3b being the most memorable device in design terms. 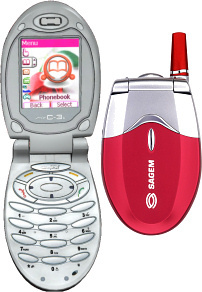 For many years, Sagem continued to make cheep and cheerful devices but recently the brand vanished and what was Sagem Mobile now makes OEM devices for other companies. Yet another defunct manufacturer that once showed promise was UK-based Sendo. The cheap but highly usable Sendo P600 was the sort of thing that should have given them a boost. Popular at the time (mostly because of the low cost), Sendo devices like this were often seen but are now mostly forgotten. Sendo's R&D team were snapped up by Motorola, but sadly Motorola closed the division a couple of years later. NEC were a pioneer of 3G handsets in Europe, and the NEC E228 was a popular model in that market.. but also one of the last phones that NEC would make for Europe. An inexpensive device, it still had video calling and expandable memory, but most Hutchison 3 customers would never use those features. NEC was another Japanese manufacturer to leave the market, this time in 2006. A manufacturer that has done rather well since 2004 is LG. Most notably, LG made "U-series" 3G devices for 3. 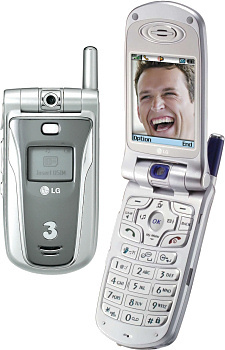 Early 3G handsets such as the LG U8130 lacked what we would regard as the basics of Bluetooth and expandable memory, but they could access 3's "walled garden" and make video calls. Of course, these days users want unrestricted web access, multimedia on their memory card and don't care much about video calls.. so perhaps it's not surprising that few people really wanted to use 3G when it came out! Quite a lot of companies demonstrated that they had real vision in 2004, with 3G devices and touchscreen phones pushing technological boundaries.. although there was no real interest from customers. Fashion phones did rather better, and many manufacturers pulled back from their high-tech offerings, which proved to be a mistake in the long run.